As with her previous novel, Before I Fall, Lauren Oliver has created a story for young adults rich with emotional depth and a sincerity that never rings false or feels falsely promoted. Whether detailing the friendship between two young women or narrator Lena's unfolding to romantic love, Oliver takes her time to ensure that the scenes arrive with vivid description and an emotional truth. Her recreation of Portland, Maine is detailed enough to inspire readers to scan maps for street names and landmarks, while her take on a future that surgically manipulates the emotional capacity of adults is all too plausible. 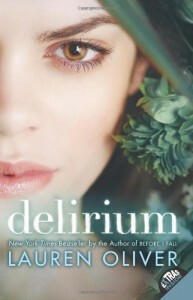 Delirium may not feel as wrenching as Before I Fall, but it misses none of its depth of craft or obvious love for character.